I bought a refurbished Wii and I felt the remotes were not performing as well as I remembered them. So I started looking up the net and it seems that counterfeit Wii remotes that look quite like the original are a "thing". I weighed them and they are 80g with the strap, which is indeed a bit light according to some sources. To make sure I opened one and it does not look like the pics I see from genuine Wii remotes. But just to make sure Nintendo has not changed the designed and I am looking at older pics only, could you guys weigh-in and tell me if I am right and these are knock-offs? EDIT: I also see that the sensitivity setting for the sensor bar appears to do nothing when used with these remotes. Supposedly changing the sensitivity affects the IR sensitivity of the remote, but from min to max it makes no difference. I guess that's a way to tell a counterfeit, right? Edit 2: I contacted the seller and he did not debate at all, he told me he is sending two replacement remotes. Thanks for the answers, not sure which one I should "accept". It's definitely not an official Nintendo remote, unless there's a regional manufacturing difference I'm unaware of. Do a Google image search for "wii remote" and look at the bottom. It is not "counterfeit". If it were, it would have the Wii logo. First tip is actually the screws. The screws are suppose to be triwings (Y shaped), and one needs a special screwdriver for them. The fact that they are using standard Philips screws seems to indicate a counterfeit. First tip is actually the screws (see this article from IGN on Wiimote disassembly: The screws are suppose to be Y shaped, and you were suppose to need a special screw driver for them. The fact that they are using standard Philips screws seems to indicate a counterfeit (as T.J.L. said, an authorized refurbishment shop should have access to the tools for those Y-shaped screws). Another very noticable tip is that there's no Wii logo! If you do a Google image search for "wii remote" and look at the bottom. If you check the plastic parts you'll notice the absence of the "Nintendo" legend. 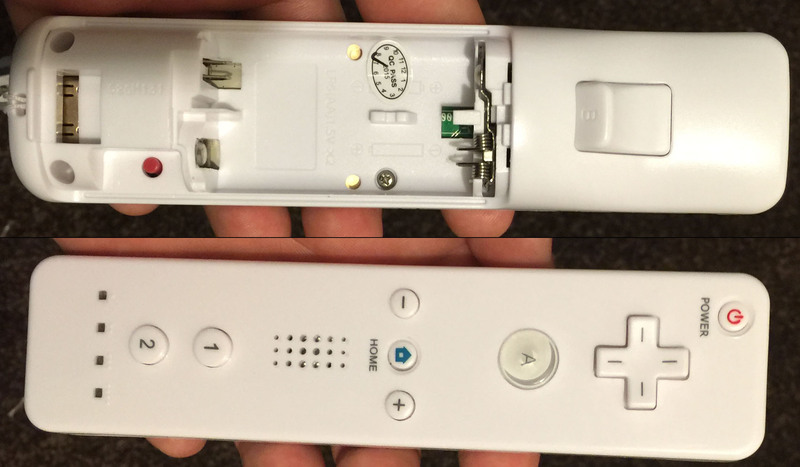 If you look at a official wiimote it will say Nintendo on each of the plastic case parts. This absence of the word Nintendo marks it as a counterfeit immediately. It may still function correctly but it is not an official wiimote. From a hardware design point of view, there are a few clues that may be extracted. This is a breakdown of the main differences of the PCB (ie: the green board) with a new controller (image is apparently copyrighted, so it's not being included here). The main components (ie: the black chips soldered to the green board) are very different. The ones in your controller are smaller, and although it's hard to make out the manufacturer it's not far fetched to assume they're cheaper than the "official" ones, which are from well known and trusted manufacturers. Silkscreen (ie: the white labels printed on top of the green board) are different in engineering practices. Your picture shows a very basic silkscreen use: it just says which component is which. In the image I linked above, silkscreen use follows a much more professional use (arrows for pin identification, label areas, indications for testing). Individual serial number / manufacturing id. On the image I linked to, there's a silkscreen rectangle to the left, where a number is marked with black ink. A truly professional company (like one expects Nintendo to be) will mark each individual controller when assembled. This allows to track every single controller together with the PCB's serial markings in silkscreen. Sensor bar sensitivity. If you try to adjust the remote's sensor bar sensitivity from the Wii options, nothing really happens. From settings 1 to 5 the "dot" display will remain exactly the same, as counterfeit controllers seem to cut some corners in their IR sensor logic. In conclusion, your images don't seem to be from a product that's supposed to have all sorts of certifications, be manufactured in several locations, be sold worldwide, and be supported globally in proper way. If you look at a official wiimote it will say Nintendo on each of the plastic case parts. It may be due to the quality of your photos but I do not see the brand name anywhere on it. This absence of the word Nintendo marks it as a counterfeit immediately. It may still function correctly but it is not an official wiimote. Not the answer you're looking for? Browse other questions tagged nintendo-wii wiimote or ask your own question. How to quickly pair a guest's Wii remote? Can I share Wii demos with friends? Wii MotionPlus vs. Wii Remote Plus : is there a difference in quality or gameplay? How can I tell if Nintendo Wii accessories are genuine/official? Which Wii console version has GameCube compatibility?